We build effective and beautiful websites, that are optimized for search engines and have the right look and feel for your brand. Our holistic digital marketing strategy will build a coherent multi-channel plan to help you achieve your business goals at the lowest possible cost. Our SEO services will help you rank higher in search results and drive more organic search traffic to your website. We deliver outstanding search-engine-optimized content that will turn your visitors into paying customers. We will improve the performance of your online ads so you can sell more at a lower price. Starting with a powerful social media strategy, we will help you engage with your customers and become more influential online. Whether your goal is customer acquisition, building relationships or increasing brand awareness, we’ll set up the right email marketing campaigns for you. 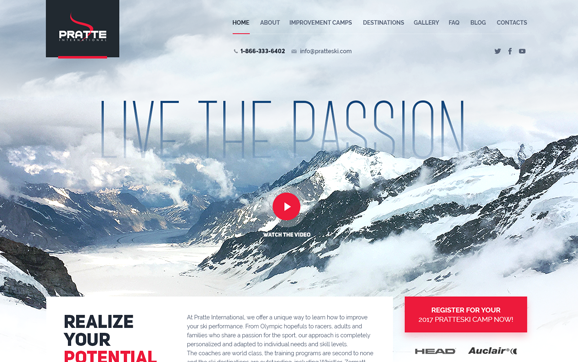 Pratte International offers completely personalized ski camps to everyone who shares passion for the ski sport. We did a full redesign and reworked the website architecture. Lance Surety is one of the top surety bond agencies in the U.S. The team at Presitely created and executed a content marketing strategy that increased the website's organic search traffic by 258%.